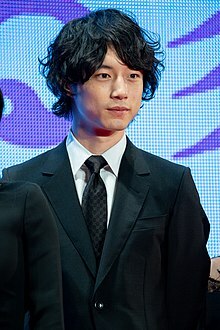 Kentaro Sakaguchi (Japanese: 坂口 健太郎, Hepburn: Sakaguchi Kentarō, born July 11, 1991) is a Japanese model and actor. He debuted as a model in Men's Non-no magazine in 2010, and as an actor under Tristone Entertainment in 2014. He has since starred in television series Tokyo Tarareba Musume (2017) and Signal (2018), as well as films The 100th Love with You (2017) and Color Me True (2018). Sakaguchi debuted as a model in 2010, and has since appeared in cover stories and pictorials for several magazines including Men's Non-no for which he was an exclusive model for 7 years. He has also participated in fashion shows like GirlsAward 2014 Spring/Summer and GirlsAward 2015 Spring/Summer. In 2014, Sakaguchi made his film debut as Shun in Shanti Days 365 Days, Happy Breath. In 2015, he made his television debut as Ichikawa Manabu for the Nippon TV drama Yokokuhan: The Pain. In August 2015, he appeared in the music video for "Yozora", a single by Miwa. In September that year, he gained popularity after appearing in the film adaptation of the manga Heroine Shikkaku and was featured in a variety of advertisements for L'air de Savon, Onitsuka Tiger, and niko and.... In 2017, he played his first leading role in the film The 100th Love with You. ^ "坂口 健太郎 - MODEL". Men's Non-No. April 1, 2015. Retrieved April 18, 2016. ^ "Tristone Entertainment Inc". Tristone Entertainment. April 1, 2015. Retrieved April 18, 2016. ^ "坂口健太郎、初のスタイル&フォトブック「坂道」発売]". FashionSnap.com. November 7, 2015. Retrieved April 18, 2016. ^ 「テラスハウス」屋台が登場 番組ゆかりフードをメンバーが"おもてなし" (in Japanese). modelpress. 2014-04-18. Retrieved 2016-10-29. ^ 山本美月＆山本裕典「GirlsAward」出演決定＜GirlsAward 2015 S／S＞ (in Japanese). modelpress. 2015-04-17. Retrieved 2016-10-29. ^ "Fresh actor with a seasoned face: Laid-back Kentaro Sakaguchi plays sincere, endearing lover". The Japan News. ^ "Miwa - Yozora (feat. Hazzie) (夜空。 ハジ→)]". Music Play On. August 19, 2015. Retrieved April 18, 2016. ^ "せっけんの香りの新ブランドがデビュー 坂口健太郎と比留川游がイメージモデルにW起用]". FashionSnap.com. February 26, 2015. Retrieved April 18, 2016. ^ "坂口健太郎、Iriya　niko and… ニコアンドのCMに出演中のイケメン２人". CM男子. May 13, 2014. Retrieved April 18, 2016. ^ "miwa＆坂口健太郎W主演！ 歌姫と一途男子の恋を描く…『君と100回目の恋』". Cinema Cafe.net. April 7, 2015. Retrieved April 19, 2016. ^ "MIWA & KENTARO SAKAGUCHI WILL TRAVEL IN TIME IN 'KIMI TO 100-KAIME NO KOI'". Arama Japan. April 17, 2015. Retrieved April 19, 2016. ^ "アニメ映画『ドラクエ』豪華キャスト13人公開 主人公に佐藤健、ビアンカに有村架純、フローラに波瑠". Oricon. Retrieved April 4, 2019. ^ "[단독] '시그널' 日 리메이크 확정, 사카구치 켄타로 출연". YTN. ^ "Sakamichi". Book Web USA. ^ "樹木希林、佐藤浩市、松坂桃李ら 今年も豪華受賞者が出席予定！ 《おおさかシネマフェスティバル2016》 ベストテン＆個人賞を発表！". Kansai Pia. ^ "ELLE Holds Awards Ceremony for the "ELLE Cinema Awards 2017"". Hearst. Wikimedia Commons has media related to Kentaro Sakaguchi.